Information: Virgil Leroy Morton (1913-1981), dancer, teacher, director, educator, mentor, and author of books about dance. Virgil Morton was born on January 24, 1913, in Sioux county, Nebraska, to Priscilla and David Morton. He attended high school in Mitchell, Nebraska and graduated with honors in 1931. During the summers of 1930 and 1931, Morton received dancing instruction in ballroom, folk, and musical comedy at the Soderstrom School of Dance in Denver, Colorado. 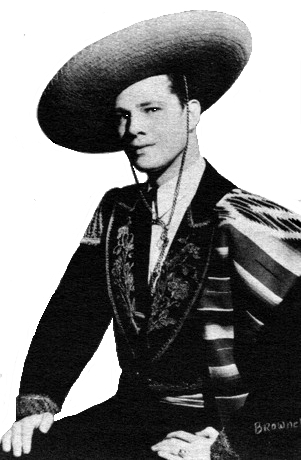 After his graduation, Morton worked as a chorus dancer with the Fanchon-Marco units at the Tabor Theatre in Denver and taught ballroom dance at Soderstrom School of Dance. Morton attended college briefly, from 1932-33, as a journalism major at the University of Nebraska. He then returned to performing and appeared in various minor dancing parts in motion pictures at MGM and Paramount Studios. He also appeared as a dancer in several of Theodore Kosloff's Hollywood Bowl productions. In 1935, Morton moved to San Francisco, where he began teaching ballroom dancing at Albert Ludwig Studios and studying tap and acrobatic dancing at the Fanchon-Marco Studios. The following year, he began study of Spanish and Mexican dancing with Jose and Elisa Cansino. In late 1935 or early 1936, Morton also joined the Swedish Applied Arts Group, which met weekly to practice Scandinavian folk dances at the home of Valborg "Mama" Gravander. From this group, Song Chang, a Chinese greeting card artist, organized an international folk dancing group, International Folk Dancers (later called Chang's International Folk Dancers). After reorganization, Virgil was selected to be Chang's first official teacher in 1937. This group performed in the Estonian Village at the Golden Gate International Exposition in 1939 and 1940. Morton himself appeared as a dancer and actor in the Calvacade of America pageant at the exposition. He also enhanced his professional training through study of dance and drama at the San Francisco Theatre Union and study of ballet at the San Francisco Opera Ballet School. Morton next studied at the George Pring Studio and appeared as a dancer in The Enchanted Well, a musical comedy held at the Tivoli Theatre in September 1940. During the early forties, Morton divided his time between dancing and military service. From October-December 1940, he joined a dance quartet and toured night clubs in the Pacific Northwest. Morton also served as an instructor for several Bay Area folk dance groups, including Chang's International Folk Dancers, the Marin Folk Dance Society, and the Alpine Club Folk Dancers. In 1942, Morton appeared as a dancer in two San Francisco productions, The Devil and Daniel Webster and The Rose Masque. Morton began his military service for World War II on August 18, 1942, at the United States Navy Recruiting Station in San Francisco. He then transferred to the U.S.S. Bosque and participated in naval operations in the Pacific. On December 16, 1945, Morton received an Honorable Discharge from the Navy. He immediately returned to study and teaching, working as a dancer for the San Francisco Russian Opera and Ballet Company from April 26 to May 11, 1946 and attending the Holloway School of Theatre. After these engagements, Morton served as a lead dancer for the Savoy Light Opera Co. This group toured throughout the United States and Canada between August 1946 and July 1947, performing a repertory of Gilbert and Sullivan operettas. From 1947-48, Morton performed in the ballet section of the Metropolitan Opera Company and also took part in the International Folk Dance Festival at the Philharmonic Auditorium in Los Angeles. In the late forties and early fifties, Morton continued to perform professionally, to teach, and to further his dance education. From February 1948 to June 1949 and April to December 1951, Morton attended the American Theatre Wing School in New York and completed coursework in dance and drama. He also joined the Savoy Light Opera Company's tour of eastern Canada, Minneapolis, and Chicago from October 1948 to February 1949. This production was followed by a tour of California with The Wayfarers, a trio consisting of Virgil Morton, Madelynne Greene, and folk singer David Allen. The Wayfarers eventually appeared on the KPIX television program, Folk Fest, for a six month period in 1948 and 1949. During the fifties and sixties, Morton devoted the majority of his time to teaching. From June 1951 to 1955, he taught folk and ballroom dancing for various recreation programs around the Bay Area. In June 1953, Morton began teaching folk and ballroom dancing for the summer session at San Francisco State University. He continued to offer classes at SFSU until his resignation in 1971. Morton also gave private dance lessons at his own studio. In addition, Morton assisted with the dance components of the Valley of the Moon Vintage Festival in Sonoma and the Mt. Tamalpais Mountain Play. Between 1954 and 1960, Morton also served as co-director of dance for the Sherry Players, a folk dance group which gave presentations on traditional folk dances at various cultural events. Along with all of these other activities, Morton published numerous articles on folk dancing and the teaching of dance in such journals as Let's Dance! and Viltis magazine. In 1972, Virgil was a participant at the second Festival Folklorico Internacional in Oaxtepec, Morelos, Mexico. Virgil Morton passed away of a heart attack on February 2, 1981. The teaching of popular dance. Virgil L. Morton. Illustrated by Hilda Sachs. New York: Pratt, 1966; Columbus, Ohio: Merrill, 1968. This is ballroom dance. Lois Ellfeldt and Virgil L. Morton. Illustrated by Hilda Sachs. 1st ed. Palo Alto, Calif.: National Press Books, 1974.